the "Kirdi", non-Islamic or recently Islamic peoples of the northern desert and central highlands (18%). The Cameroon government held two national censuses during the country's first 44 years as an independent country, in 1976 and again in 1987. Results from the second head count were never published. A third census, expected to take years to produce results, began on November 11, 2005, with a three-week interviewing phase. It is one of a series of projects and reforms required by the International Monetary Fund as prerequisites for foreign debt relief. The first results were published in 2010. According to the 2017 revision of the World Population Prospects the total population was 23,439,189 in 2016, compared to only 4 466 000 in 1950. The proportion of children below the age of 15 in 2010 was 40.6%, 55.9% was between 15 and 65 years of age, while 3.5% was 65 years or older. Registration of vital events is in Cameroon not complete. The Population Departement of the United Nations prepared the following estimates. Speakers of Makaa–Njem languages in Cameroon and neighbouring countries. The ethnic groups of Cameroon who speak Duala languages. 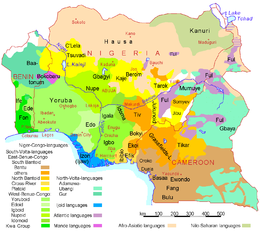 There are 24 major African language groups in Cameroon; additionally, English and French are official languages. Cameroonian Pidgin English is also widely spoken. Peoples concentrated in the Southwest and Northwest Provinces—around Buea and Bamenda—use standard English and Cameroonian Pidgin English, as well as their local languages. In the three northern provinces—Adamawa, North, and Far North—either French or Fulfulde (the language of the Fulani) is widely spoken. Elsewhere, French is the principal second language, although pidgin and some local languages such as Ewondo, the dialect of a Beti clan from the Yaoundé area, have a wide currency. Estimated number of inhabitants (in thousands), based on 2005 data from the Food and Agriculture Organization. According to Cameroon government website, average children per woman was 5.0 in 2004, 4.7 in 2016. ^ a b "Population Division of the Department of Economic and Social Affairs of the United Nations Secretariat, World Population Prospects: The 2010 Revision". Esa.un.org. Retrieved 2017-08-27. ^ "MEASURE DHS: Demographic and Health Surveys". microdata.worldbank.org. ^ "Cameroun : Enquête Démographique et de Santé et à Indicateurs Multiples 2011" (PDF). Dhsprogram.com. Retrieved 2017-08-27. ^ a b c d e f g h i j k l m n o "Africa ::CAMEROON". CIA The World Factbook. ^ "The World FactBook - Cameroon", The World Factbook, July 12, 2018 This article incorporates text from this source, which is in the public domain. ^ "LA POPULATION DU CAMEROUN EN 2010" (PDF). Statistics-cameroon.org. Retrieved 2017-08-27. Wikimedia Commons has media related to Demographics of Cameroon. UNDP. 2006. Beyond scarcity: Power, poverty and the global water crisis. Human Development Report 2006. New York: United Nations Development Programme (UNDP).